Since rain season has once again descend upon us, we have to resort to indoor activities. Ever notice that the coffee shops are always jam packed during this time of the year. It's simply because there are nothing better to do in this horrible weather. Actually it's quite cozy and relaxing to sit inside of a coffee shop sipping a hot drink while "enjoying" the rain. Our first stop was Caffe Artigiano, but it was completely full. We then walked over to Take 5 cafe where a similar fate was met. So in the end, it was a choice between either Starbucks or Blenz, and it just so happen we saw Blenz first. Actually it was the sign for the Classic Apple Spice outside of Blenz that really caught my attention, so we decided to jump in and see if we can find a seat. Lucky for us, there were literally only 3 seats left. 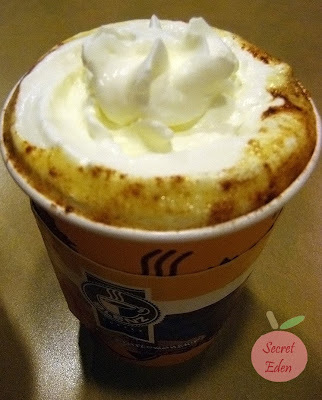 The Classic Apple Spice was made with unfiltered, unsweetened 100% pure BC organic apple juice, then finished with fresh whipped cream and a dash of Cinnamon sprinkles. 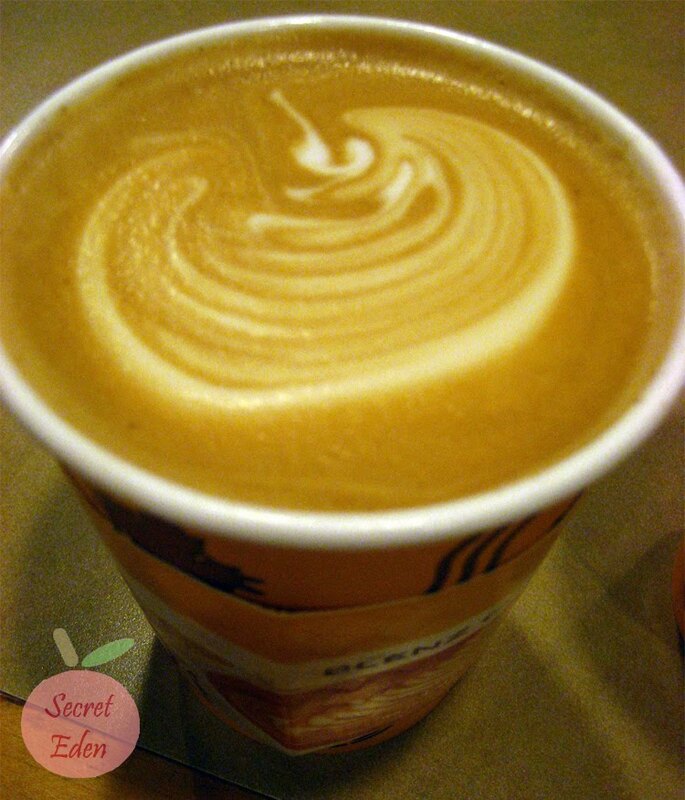 The drink was undeniably good, it had just the right amount of sweetness (as it should be, since it's unsweetened). The whip cream was rich with a perfect balance of cinnamon sprinkles. In a nut shell I liked it. However I wasn't too fond of the price (around $3.90 for a tall), I mean after all I am just drinking hot apple juice. The 2nd drink we tried was their seasonal pumpkin spice latte. R wanted it half sweet, which also meant it was lighter tasting, because the pumpkin flavor is actually a syrup, thus result in less sugar=less flavor. Since I am not a coffee drinker, I will let R do the judging. He thought the drink was good, because it has a strong espresso taste, but still had a distinct pumpkin flavor. He also liked this better than the one at Starbucks. Since we still had time to kill (we were waiting for another round of the Long Table Series), and it was getting kinda stuffy inside with the whole place packed and all, so we decided to get another cold drink to cool down. R heard some good reviews about the Iced Chocolate, so we ended up ordering that to share. I don't know if you could choose the chocolate (white, milk and dark) or not like their regular hot chocolate, because they never asked us, so we ended up with what tasted like milk chocolate. Although the Iced Chocolate was good, I don't see what's so special about it. It tasted just like cold chocolate milk, but a tiny bit more rich and creamy. At about $4 for a tall, I'd say this is somewhat of a rip off. Overall, we did like the hot drinks at Blenz. It will definitely be on our backup list on days we can't find any other unique coffee shop to try. There are just too many Ramen joints in downtown Vancouver, so I am glad that something different has joined the scene: a fast food type restaurant that serves rice/noodle bows. I been wanting to try it out for awhile now, especially after reading reviews from both I m only here for the food and Cheap Appetite. The restaurant is tiny, it can accommodate less than 20 people at a time. However since it is fast food/food court style, so lots of people get take out. They serve an array of rice/noodle bowls with a few appetizer/side dishes such as takoyaki, sushi rolls, and chicken karaage. The takoyaki is pretty cheap, it was only $3.88 for 8. However as you can see from the picture, it certain lacks a few toppings such as dried bonito and dried seaweed flakes. Even though it's missing some common ingredients, but it was still significantly better than the ones I had at G-Men Ramen. At least these were hot, crispy on the outside and soft/gooey on the inside, and with a few visible pieces of tako. I would certainly order this again, despite the lack of toppings. I couldn't decide between the noodle or the rice bowl, in the end I decided to choose the Buta-mayo don. It's described as gingered stir fried pork on rice with cabbage and mayo. For all the rice bowl, you have a choice between regular size ($6.50) or snack size ($5.50). I got the regular size, which was actually a pretty big portion that is very filling. The pork was good quality where is there is a good balance between the lean and fatty part. The thinly sliced pork is well infused with soy sauce and a subtle flavor of ginger. I thought the mayo complimented the pork very well, although I fear that this rice bowl is probably not too healthy. The other rice bowl that we tried was the California don. This particular rice bowl is actually served cold and is essentially a California roll in a bowl but minus the seaweed, with the addition of egg. The initial disappointment was that it wasn't hot, but we quickly realized that this would probably taste weird if it was hot. The rice was sushi type rice and when mixed with the topping (crab meat, mayo etc. ), plus the soy sauce it was actually quite good, until R. added the wasabi (I hate wasabi :P). Service was super fast, our meal came out within 5 min after we ordered. Prices here are cheap, but then again it's only the food you are paying for, not service or ambiance. After the meal, I was happy and full. Since their rice bowls certainly made a good first impression, so now I am really tempted to come back to try their noodle bowls. Now, I think my next hard decision would be ramen or udon. In the end, I would certainly recommend Donburiya, as it's fast, convenient located, and delicious, but good luck trying to get a seat during busy times. For reasons that I may one day abandon Shaw and other problems, I have decided to move my blog. So here it is, my "Grand Re-Opening" of my new blog: My Secret Eden 2. I have been blogging now for more than a year, time certainly flies. My Secret Eden readership has grown significantly and it is all thanks to you. In celebration of my new blog, as well as my already pasted blog-a-versary and Christmas, I am hosting a Giveaway to thank all my readers/supporters. PS: for some reason, the background only show up in firefox, not IE. Can someone help please, thanks!